Author's note: If you haven't read Part Ten and Part Eleven, please do so as this is intimately connected to what went on in those parts. Reminder: This is taking place on the Thursday before Easter in 1994. The Bureau agents, Medical Facility staff, and other personnel who attended the Noon Mass on that Holy Thursday dispersed as the service came to an end. Any conversations they might have indulged in were curtailed by their awareness of Hellboy's continuing presence in the chapel. He sat there in absolute silence, as he had sat throughout most of the just completed Mass; his head dropped down in his huge right hand, his left hand clinging tightly, even painfully, to Kate Corrigan's right hand. Orrin Jerrold, having removed the vestments he had worn as celebrant of the Mass, returned into the chapel and sat in the seat to Hellboy's right. "You never came up for communion, Red. Wouldn't you like to; especially on this day of all days?" Hellboy, who had not looked up when Orrin sat down, merely shook his head; mumbling something about denying himself the Eucharist because he hadn't been to confession in ‘donkey's years'. "You never let that stop you in the past," Kate said, gently coaxing him to look up and release his crushing grip on her right hand. "Maybe I should've," he groaned, "Maybe I should start doin' things like I'm s'posed to." Hellboy found he still couldn't look at Kate or Orrin. "I am sorry that I wasn't there to help my father, but… I…" he hesitated briefly and then went on, "I'm not sure I'm sorry that I went looking for Liz." "You made some bad choices, H.B.," Orrin spoke, before Hellboy could burden himself with more guilt, "But bad choices are more often mistakes of judgment rather than terrible sins. What you need to do is learn from these mistakes, not beat yourself up over them." "I know you're probably right, O.J." Hellboy finally turned to face Orrin, "But I still feel like I need to do something to, you know…" he trailed off. "Yeah, I know," Orrin gave Hellboy a small grin, "That's one of the reasons why we go to confession." Orrin looked over at Kate, "Could you leave us alone for a while?" Kate nodded, "I'll go look for Abe. He's probably in Trevor's office." She slipped out of the chapel and moved quickly toward the exit into the main Bureau facility; not wanting to hear anything of what should be a disclosure known only to Orrin. Orrin had been right; after unburdening himself to a sympathetic ear, Hellboy felt lighter of heart. After going with Orrin to the small altar at the front of the chapel, Hellboy allowed the priest to administer the communion bread and wine he had denied himself earlier. Leaving Hellboy in the chapel to pray alone for a while, Orrin went to arrange for a replacement priest to be sent for the other Masses still to be done for this holiday. When it was time for Hellboy to go to the hospital, Orrin thought there might be a need for a priest. Thinking that one known to both Trevor and Hellboy would be preferable to a stranger, he planned to accompany Hellboy to the hospital. Not wanting to still be in the chapel as the next Mass began, Hellboy eventually joined Kate and Abe in Trevor Broom's office. As he walked in, both could tell that his mood was somewhat more upbeat. Before anyone had a chance to speak, the telephone on Trevor Broom's desk rang. Hellboy's heart skipped a beat as he wondered if this would be the summons to visit the hospital; or was it bad news? That latter thought was something he definitely tried to block from his mind. Abe took the call, listening to who was on the other end. "Yes, she's here," he said in reply. He then handed the receiver to Kate. "It's for you; Margaret Nolan from the University of Pittsburgh." "Yes, Maggie?" Kate pushed a nervous hand through her shoulder-length dark blond hair. Then her worried expression turned to one of relief. "Thanks for taking care of that for me. Tell the folks in the Anthropology Department I hope to be coming sometime after Easter. Like I said earlier, a personal crisis has arisen and I thank you for taking care of my luggage and personal effects." Kate listened to the woman on the other end of the phone. "Thanks again. I hope to see you soon." Terminating the call, Kate turned toward Hellboy. "I might not have made it to Pittsburgh, but my stuff did. I just didn't have time to get it off the plane when the telegrams finally caught up with me. Thank goodness, I was able to reach Maggie at home and arranged for US Airways to allow her to lay claim to my luggage and other effects that I had checked on the flight to Pittsburgh." Moving closer, Hellboy took her hand. Abe moved away to give them privacy. "So, I guess you're still gonna go to Pittsburgh. I was kinda hoping that maybe you'd change your mind." Kate drew Hellboy into a hug. "You always were and still are my very best friend, Hellboy, and I'll stay as long as you and Trevor need me. But my reasons for going to Pittsburgh haven't really changed all that much. I think we both understand that." Pulling Kate closer, Hellboy laid her head on his chest. "Yeah, I understand," he murmured, his voice seeming to echo from subterranean pits rather than his lips, "But you know, Katie, I'll still miss you." Drawing back from his tight embrace, Kate reached up and touched his cheek. "I think we both understand that, too, Hellboy." For the first time since Abe had given him the news about Trevor Broom, Hellboy smiled slightly. Opening his mouth to say something further to Kate, he was cut off by the phone ringing once more. His heart again leaping into his throat, Hellboy watched as Abe took this second call. Just as he was doing this, Orrin walked into the office. "Yes," Abe sounded relieved, "Thank you for this good news. Give us around ten or fifteen minutes. I'll call back when he's ready." Abe hung up the receiver. Barely registering Orrin's arrival, Hellboy moved closer to Abe; clutching his huge right hand in a tight fist to keep control of it. "Good news, Abe? You mean news about my father?" Abe wrapped his arm around Hellboy's shoulders, noting the tension there. "Very good news, Red. The Professor had briefly regained consciousness and is now able, with just the assistance of oxygen, to breathe on his own. He is unconscious again; but rather than being in a coma as before, it is more like a natural, if very deep, sleep." As Abe continued speaking, he could feel Hellboy relax. "His heart rate and blood pressure are also stabilizing and should soon approach normal levels. As soon as you are ready to depart, the FBI will take you to him." "Good," Hellboy sighed, ‘Will you and Kate be coming?" Hellboy was loath to admit, even to himself, that he was reluctant to visit with Trevor Broom alone. Abe shook his head. "I would love to, Red. I, too, am very anxious about the Professor's well being; but the FBI wishes to arrange for your visit after regular visiting hours. Hospital policy reserves this type of visit to immediate family only. Unfortunately, neither I nor Kate would be considered family." Orrin Jerrold stepped forward, "I've freed myself for the rest of the day, H.B. and Tom Manning is arranging that I accompany you as the family priest. I thought it might be a good idea." Looking relieved, Hellboy turned toward Orrin. "Thanks a lot, O.J. I still wish Abe and Katie could come with me, too; but, you're right, a priest being there with me might not be such a bad idea." At first, it had seemed to Hellboy as if finally getting to see Trevor Broom was going to take forever. Yet, once he had really found that it was going to happen, it seemed like everything was happening way too fast. It seemed like one minute Tom Manning and a group of FBI agents were giving him a hundred different instructions on how to handle himself at the hospital and the very next minute he was being hustled, covered in his cloak, through a rear entrance of Beth Israel Hospital in Manhattan. As Trevor Broom's condition had improved, he had been moved from the ICU to a private room. Doctor Louis Matthews, the cardiologist who had cared for Broom since his admission, had been made aware by the FBI that caution was needed to keep Broom's hospital stay and visits from his unique ‘son' completely private. It was he who had decided to move his patient to an isolation ward in the Cardiac Care Unit, where only staff that had been debriefed would care for him. Throwing back his cloak hood, Hellboy walked into the room in where Trevor Broom was located. Seeing his father lying unconscious, attached to a plethora of machines and wires, took him back to the months before his fifteenth birthday when he had almost lost his father to a similar cardiac arrest. Yet, what had occurred in 1959, no matter how frightening it had been, could mainly be attributed to a bad medication reaction. This time, Hellboy felt even worse as guilt intensified his anxiety. He couldn't help but notice the look that passed over the face of the attendant nurse and was glad that Orrin Jerrold had been allowed to accompany him. Orrin could help Hellboy reassure the nurse, whose ID badge identified her as Marilyn Jenkins, that she had nothing to fear. When Hellboy first arrived, he had been hurrying; but halfway into the room he just stopped as if someone had suddenly pulled a plug. He then forced himself to move step-by-step closer to the bed. Just barely noticing that Orrin had gone to speak with the nurse, he knelt by the side of the bed. It was of some comfort to him that Trevor Broom was breathing on his own, with just a little assistance from oxygen through a nasal cannula. Reaching through the bars of the bed rail with his left hand, he cautiously took Trevor Broom's hand; careful not to disturb the IV inserted in it. After a long moment of silence, he leaned forward and whispered the same words he had once whispered to an unconscious Trevor Broom in 1959; but his voice had deepened so much since then that it was hard for the nurse and Orrin not to overhear. They moved away to give him more privacy. Like many residents of the New York area, Marilyn Jenkins had seen media reports of the ‘Hellboy' who reputedly worked for the FBI as a monster hunter. She had never thought these reports much more than fodder for supermarket tabloid sales or television network news ratings. To suddenly have this creature presented to her as a reality filled her with both dread and an intense curiosity. Rather than paying much attention to what Orrin was saying to her, Marilyn couldn't help looking at Hellboy as he knelt next to the bed, a nervously gesticulating tail peeping out from under his cloak. She found herself impressed with the extreme care that he had used as he took her patient's hand. Marilyn looked even more closely as Hellboy, continuing to hold Trevor Broom's hand, almost broke into tears. He then murmured something further; something she was surprised to notice was some kind of prayer. She was annoyed with herself for staring at him; knowing that she would never stare at other hospital visitors—no matter how odd-looking they were. Self-consciously clearing her throat, she turned back toward the man who had introduced himself as Father Jerrold. Knowing that the priest had probably noticed her staring at Hellboy, Marilyn blushed slightly. "I'm sorry, Father Jerrold; I can't help being curious," she spoke softly, not wanting Hellboy to hear. "Please, call me Orrie; and I hope you won't mind if I call you Marilyn," he said with a smile. Orrin gestured for Marilyn to move with him as far as possible from where Hellboy was still kneeling next to Trevor Broom's bedside. "Believe me, Marilyn," he said softly, "Your curiosity is perfectly normal; but H.B. is really nothing more or less than a man anxious about his father's health and worried that he might lose him." Marilyn nodded. "I'm not sure what I expected, Orrie; but this gentle giant wasn't it. Certainly this isn't what the media reports have portrayed about him." "No, it certainly isn't," he agreed, "But even if those reports are usually exaggerated, they aren't exactly inaccurate; just one-sided. After all, his occupation is not a gentle one. Yet, there is so much more to him than these reports show; including that comic book produced earlier this year." Marilyn leaned toward Orrin, "I've seen that comic book. My son, a doctor on the medical staff here, bought it when it was first released. When he had been a medical student at New York University in the late seventies, he was sure that he had gotten a glimpse of Hellboy at a diner near the University where something weird had happened. Over the years since then, he's collected all of the information about Hellboy he could get his hands on; including that comic book. I'm afraid I was rather dismissive of Danny's claims to have seen Hellboy all those years ago." Orrin nodded, "I haven't known Trevor and Hellboy all that long, but I understand that there was some major paranormal crisis that happened near NYU around the time you are referring to." Hellboy was often self-conscious about what other people thought of him. Yet, even though he was well aware of how closely the nurse had been watching him earlier and that she was now speaking to Orrin about him, all he could be concerned about was the well being of the man whose hand he held. That hand felt ice cold to Hellboy; and, unless he looked closely, it was hard to see the rise and fall of his father's chest as he breathed. Unlike when he had been fourteen years old, many current heart monitors functioned almost noiselessly. He wished he could still hear the steady beeping that had been so reassuring thirty-five years before. Every time he let his eyes drift closed, it felt like he was holding the hand of someone who had died. Hellboy kept glancing up at the screen on the heart monitor; assuming that the steadily undulating line full of peaks and valleys meant his father's heart was still functioning. The sense of déjà vu that he had felt earlier that morning began to intensify. He once again had the odd sensation that he was re-experiencing something from a past life rather than living in the present. An unexpected wave of dizziness passed over him. The room became unbearably cold and it was as if all of the lighting fixtures shed light while illuminating nothing. A dark voice issued from that terrible void. "This was just a test. One that I am delighted to find you failed miserably, my Son. The time is still not yet nigh, but it draws closer." 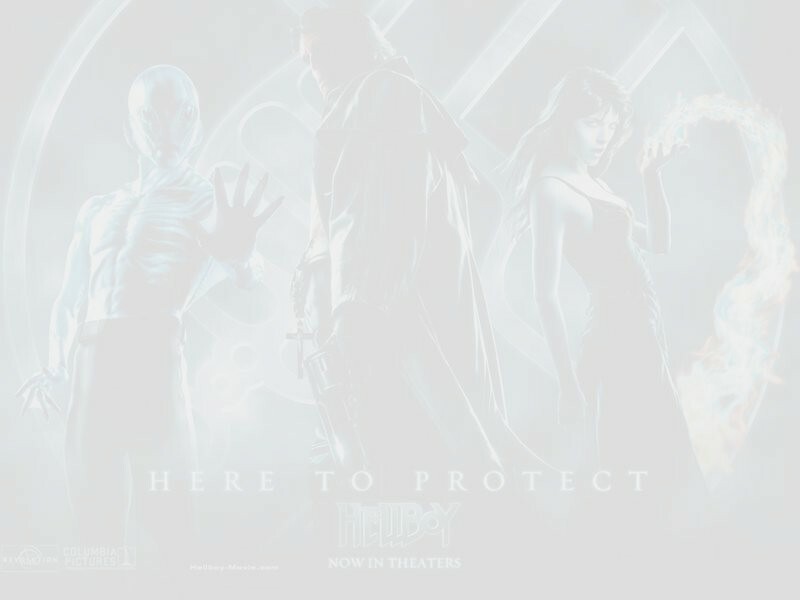 Another wave of dizziness passed over Hellboy and everything went black. When he returned to awareness, he found that he was still holding on to Trevor Broom's hand; but he had sagged further toward the floor, with his head leaning against the side of the bed. He must have fallen asleep. He certainly felt like he had been dreaming something; but whatever it had been seemed to have slipped beyond conscious awareness. Just as he was starting to straighten up again, he felt a little tremor in the fingers of the hand he held. As he looked closer at Trevor Broom, he heard him give a low moan. "Father?" Hellboy raised himself up higher in order to see him better. "Father, it's me. I'm here." He then turned toward Orrin and Marilyn. "I think he's starting to come to." Marilyn moved toward the door. "I'll send for someone to fetch Doctor Matthews. He's going to want to examine him again now that he's waking up." Orrin moved closer to Hellboy, just as Trevor Broom's eyes started to come open. He looked up at Hellboy for a long time in silence. "I looked for you," he finally said, "But I couldn't find you; so, I had to deal with it myself. And men died because I'm too damn old to be strong enough or fast enough. I should stop…"
Trevor Broom closed his eyes again. Then, as much as he was able, he turned away from Hellboy. Feeling like something about the size of his own right hand had just squeezed out all of his breath, Hellboy was taken aback as he came to realize that his father had started to weep. "Please, Father, please don't. It's all my fault; don't blame yourself." Kneeling higher and leaning over the bed rail, Hellboy carefully lifted Trevor Broom into his arms as he sobbed even harder, burying his face in Hellboy's chest. As this was happening, the door to the room opened and Doctor Matthews walked in. Orrin had again moved away during this exchange between Hellboy and Trevor Broom. He intercepted the doctor, hoping to give them a little more time alone. There were about a hundred different things Hellboy wanted to say to the man whose tears he felt saturating his cloak and shirt; but he could only hold him closer and hope that this would be enough to express everything he could never say out loud. Trevor Broom generally exhibited a typical British reserve in times of crisis and Hellboy could count on one hand the times he had seen his father break into tears like this. ‘And every single one of those times was because of me,' Hellboy thought bitterly, as he finally felt Trevor Broom calm down. "When I am sufficiently recovered from this," Broom sighed, as Hellboy gently placed him back down on the bed, "You will have to explain to me where you managed to disappear to. You are more to me than merely my son; you are one of the chief agents of the Bureau. As the Bureau's director, I must be able to count on you; to trust you to be where I expect you to be." Hellboy wanted, needed to say something further; but just then, Doctor Matthews approached them. "I'm sorry to interrupt, but I need to give Professor Broom a brief examination now and then let him rest until tomorrow, when I will give him a more thorough exam." Hellboy backed away from the bed so that the doctor could more easily approach it. "I am hoping," Doctor Matthews continued, as he drew closer to Trevor Broom, "To see you recover fast enough that you can be transferred to your own medical facility for further care; possibly even as early as Saturday afternoon." "I'd like that," Broom said with a weary smile, "I'd like to spend Easter at home; with my son." As Hellboy and the agents who had accompanied him returned to Newark, he couldn't help remembering something Trevor Broom had once said about him. "Even from the time he was nine years old, we have always been a team. Other agents may come and go; but I know that he will always be there, fighting right along side me. I trust him with my life." No matter what his intentions had been, Hellboy had betrayed that trust and knew that it would be a long, hard road before he regained it again. Author's afterword: Poor Hellboy. Unlike Trevor Broom or Abe, who came into his life and then stayed in his life, Liz keeps coming into his life and then leaving again. Even Kate, whose physical presence in his life was curtailed by her career and travels, was always a part of his life in some way. They do say that the course of true love doesn't run smoothly. P.S. Thanks to those who have been leaving such great reviews. Your kind words keep me going.